At Spanishpod101 the lessons focus on teaching how to listen and speak Spanish. Although there is a grammar review tab for every lesson, there are no written or reading exercises. Does this affect your ability to acquire proper Spanish writing skills? Not at all. Keep in mind that all the lessons at Spanish Pod101 are recorded and written. You have all the material to study, practice and review ready to download or practice on line. 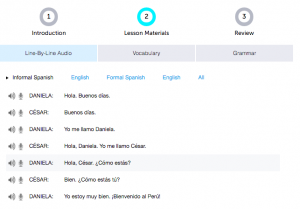 After studying your corresponding lesson at Spanishpod101 you can use your Lesson Materials tool to access the Line-By-Line Audio and the Vocabulary tabs. Here you will find all the phrases and words used during your Spanish lesson. As you can see, all words and phrases are written down. 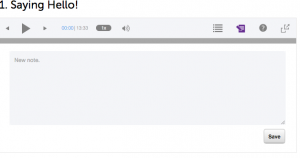 You can practice your writing skills by listening to the audio as a dictation tool. Take a note pad and write the words to see how you did. If you are traveling or if you don’t have a note pad handy, Spanishpod101 offers you a built in note pad. And practice dictation to review your Spanish writing skills. If you are in a rush or if you are going to be away from the internet for a while and still want to practice, you can download the PDF file for the “Lesson Transcript”. This PDF includes the whole class conversation in English and Spanish. You can practice either by reading the Spanish phrases yourself and then writing them down or reading the original English phrases and practice not only your writing but also your comprehension skills. I have been doing this for a while now and I have found it particularly helpful. I feel so at ease now, that I have started translating street signs on my way to work. So rest assured, you can not only develop your Spanish writing skills at Spanishpod101, but you can do it at your own style and pace. See which method suits you best and take note of you progress and the words that might require more practice.